Being a huge Whovian, I look for lots of way to sneak Doctor Who into my writing and daily life. I was handed a golden opportunity when, for the philosophy curriculum we were using, I was supposed to write a story using the philosopher we were currently studying. What better way to sneak the Doctor into a story! So, take a trip in the TARDIS with the Eleventh Doctor and my OC, Arley (also a Time Lord), to meet Thales, an ancient Greek philosopher! “So, where are we going this time?” I asked, jumping up onto the platform where the controls of the TARDIS were. Amy and Rory were gone for a week, leaving just the Doctor and me. “You want ancient? How about the beginning of Carsus?” The Doctor’s hand was on the lever. “Greece it is! There’s a lovely solar eclipse in 585!” He yanked the lever. The TARDIS groaned and shook. “Did you forget the stabilizers again?” I hollered. “Who are you, River Song? Of course I didn’t!” he shouted back. I found the blue stabilizers and pressed them down. The TARDIS was instantly quiet. “See? I told you I didn’t forget the stabilizers!” he said, tapping my nose as he walked by. I rolled my eyes, not bothering to mention it’d been me who’d turned them on. “I’ve a friend in ancient Greece you know. His name’s Thales! Great guy, a little distracted.” The Doctor skipped down the steps and under the platform of the TARDIS. I skipped over to the door, opened it, expecting lovely river views. Instead, I got a battlefield. I slammed the TARDIS door shut just as a large spear went splintering into the side. Just then the doors opened again, and in stumbled a man. He tripped over the door frame and papers went everywhere, causing me to jump backwards. Part 2 is next week. Thanks for reading! By now, all of my readers are well aware of my love of writing fanfiction. Not only is it really fun to explore and expand on someone else’s world, it also gives me the opportunity to try writing as characters and personalities I wouldn’t normally write. However, sometimes it’s not always easy to get the original characters sounding like themselves. So, today I’m sharing four tips of what I do to stay in character while writing fanfiction. Actor interviews are great when trying to get inside a character’s head. They have literally been that character for months at a time, and they can often offer some great insights into how their characters think and act. Also, a lot of actors have great backstories they’ve made up about their characters that can give some ideas for future fanfictions. Whenever I start “losing my grip” on a character, I always rewatch a scene with them in it or reread their lines in the book. That helps to remind me how they talk and the gestures they make so that my fanfiction is more authentic. I do this a ton while writing Doctor Who fanfiction. The Doctor’s a complicated character and watching a clip of the show always helps me to refocus on who he is as a character and get the little quirks that make the Doctor the Doctor. Sometimes, it’s not easy to get a character sounding like themselves. I try to use the actual lines the character has spoken as much as possible. I try to be careful when I do this so that the lines aren’t awkwardly forced into a scene which never sounds good! However, if it fits in naturally, then I add it in. I wrote a Psych/Doctor Who crossover fanfiction, and to make Gus sound more like Gus, I included a bunch of his actual lines from the show. It really gave Gus his trademark sound and made it easier to recognize him as Gus. Whenever I first start to write fanfiction for a series, the characters never sound exactly like themselves the first time around. It takes a lot of writing to finally get them to the point where they sound recognizable. So, even when I don’t get it right the first go-round, I know that with a bit more practice, the character will eventually get there! This is the final part of my Doctor Who fanfiction about the Silence. Last week, Karen discovered it was the Silence that was following her, and Amy Pond told her to find the Doctor. I turn back to the diary, my hands shaking. I take one more look around the room and, reassured for the moment that I am alone, search the few pages left for an answer. The next thing I remember, I was walking back to my house with Anthony. The afternoon had been such a blur. I remember eating a muffin, saying good-bye to Mrs. Williams, and now I was here. Still, I felt like I was forgetting something. We arrived at my house, and Anthony gave me a smile and a wave, before turning to walk home. “See you tomorrow,” I called. “Bye!” Anthony called back as he rounded the corner. Suddenly, everything I’d forgotten came flooding back. Huddling on the floor with the Silence surrounding us in Anthony’s apartment, Mrs. William’s instructions, and my absolute terror. I unlocked the door and pushed it open, eager to get inside, though it wasn’t like the Silence couldn’t be in there, too. I rushed into the living room, calling my parents. “Mother! Father?” I gripped the note in my hand and shouted for them again, but the only response was the echoing of my own voice. There was no sign of my parents, in fact, it was just like I’d left it this morning. Where are they? They’re usually home at this time. I looked up, catching sight of my reflection in the mirror and covered my mouth with my hand, a scream stuck in my throat. Tally marks covered every inch of my face. The Silence were here. I didn’t know what to do. Escape? Run? No, they’d just track me down again. What I needed to do was to remember. Mrs. Williams said they’d erase my memory of them. I’d write it all down. That way I couldn’t forget. I raced out of the living room and dashed up the stairs to my room. And that is where I am now. Writing down what happened to me. I don’t want to forget. That can’t be it! That can’t be all there is! I pick up the diary again, clawing through the pages. What did I miss?! There has to be an answer! There has to be a way out. The pages bend back, revealing one more page in the diary. My fingers tremble as I yank it free from the binding. Tally marks make the page almost black, they’re so many of them. “NO!” I shriek. My heart feels like it stops beating for a moment as I realize what that means. Karen never got free. Karen couldn’t escape. “NO!” I stand up, burying my face in my hands. There’s no way out. I’m trapped. I stand, facing the window, trying to collect my panicked thoughts enough to think of a plan. My eyes catch sight of something moving behind me. I spin around, and there are the Silence. I don’t know how many. They stare at me with their hollow eyes sunk into their long gray faces. The Silence in front of me tilts his head as he raises a three fingered hand. In that moment I remember my mom. Where was she? Why wasn’t she downstairs? Had they killed her? Trembling, I take a wobbly step backwards, trying to get away from the monsters. Poor Karen never had a chance to find the Doctor, and I don’t think I will either. My boots slip on the edge of the rug, and I twist, catching myself on the window sill. “What was I doing?” I ask out loud. Sitting on the carpet, I rub my wrist that is aching and red. I don’t remember hitting it. I know I was frightened of something, but of what, I couldn’t remember. It was something about my mom, which is funny because she is downstairs, cleaning. I stand up, dusting myself off, turning towards the window. As I do, I catch sight of my face in the window. It’s covered with tally marks. And then I remember. Our pounding feet on the metal stairs echoed through the apartment building’s hallway. We came to a halt outside Anthony’s front door. Pulling the key from his jean pocket, his fingers fumbled as he inserted the key into the lock and twisted it. We burst through the door and slammed it shut behind us with a loud bang. “Is that you, Anthony?” called a voice. “Mom, I’m home, and I brought Karen,” Anthony said as we walked into his warm, bright kitchen filled with the smell of baked muffins that Anthony’s mother was pulling out of the oven. His mother turned around with a smile. “Karen, it’s always good to see you.” I smiled back despite my anxiety. Mrs. Williams was always so nice and had the prettiest smile and red hair. And I loved her Scottish accent. “Karen has a question for you,” Anthony explained with an encouraging nod towards me. “In fact, we were followed here, ” Anthony added. “I don’t know. There are gaps in my memory that I just don’t understand. I thought there was this shadow following me the other day.” I stopped for a moment, trying to gauge Mrs. Williams’s reaction. She didn’t say anything. “I know you must think I’m crazy,” I started to say. “I’ve seen some strange things, kid. Trust me. I don’t think you’re crazy.” She leaned against the kitchen counter and pushed her flame colored hair back with her red painted nails. “Mom, I found this on my hand. I don’t remember how it got here.” Anthony held out his hand towards Mrs. Williams. What happened next was fuzzy. I remembered turning towards Anthony, about to ask him something, and then the next thing I knew, I was huddled on the kitchen floor with Mrs. Williams beside me and Anthony on the other side. A scream shatters the stillness of the room. I look up from the diary, my heart pounding. I put the book down on the bed and stand up, the floor creaking slightly. It’s deathly silent in the house, and even though it’s not cold, I have goose bumps on my arms. “Mom?” I ask, cautiously taking shaky steps down the first two or three stairs, but the only answer is my own voice echoing back. “Mom?” I call, a little louder this time. My answer is a loud banging, and the whistle of the wind. I wrap my arms around myself, climbing down the stairs, forcing my feet to move. The wind bangs the front door against the battered wall, the rain pouring in onto the floor. I slam the door shut and lock it tightly. The rain is running down into my eyes as I turn away from the door. I shut my eyes for a moment, drying my face off with the edge of my shirt. When I open my eyes, I’m not downstairs. My back is against the heavy wooden door to the bedroom, and the diary is open in my hands. “What happened? Where am I?” My head is spinning. I look down at the diary in my hands, and flinch, my heart starting to race again. My hands are covered in tally marks. The Silence. I’d seen Karen’s shadows. They are following me, too. I flip open the diary, the pages making a slight rustle as I turn them. There seems to be only one thing to do. Find out if Karen escaped and how, if possible, I can as well. Last Tuesday, I posted the second part of my Doctor Who fanfiction about the Silence. Bree had stopped reading Karen’s diary entry, realizing she was being followed, too. I mentioned last week that Karen’s name was a reference to the actress who plays Amy Pond. Well, I snuck in another reference to the show in the date of the diary entry. April 23 is the date that “The Impossible Astronaut,” the episode that introduced the Silence, first aired. There’s another reference, as well, to a deleted scene from the last episode the Ponds were in. Anthony was the name of the son the Ponds adopted, and in my story, he’s Karen’s best friend. Also Kaz, Anthony’s nickname for Karen, is the same as Matt Smith’s (Eleventh Doctor) nickname for Karen Gillan (Amy Pond). I forced myself to breathe normally as I stepped inside the school, pushing past the other students chatting by their lockers. “Anthony!” I called to a brown haired boy putting his extra books in his locker. He turned, hearing my shout, and gave me a wave. I scooted past a group of chattering girls to join Anthony. “Kaz” is the nickname he gave me years ago that he uses to drive me crazy. However, I wasn’t in the mood to play games today. “There’s something following me,” I told him in a low whisper, clutching at his arm. “I saw a shadow yesterday while I was walking home. I know it followed me. And the mirror. I saw something in the mirror, but I can’t remember what it was.” The words spilled out of my mouth, one on top of another. Anthony didn’t say anything for a moment. “Are you sure?” he said slowly. “I think you need to talk to my parents.” The bell cut our conversation off, and we hurried to our class. I slipped into the seat in front of his, and I felt something poke my arm. I looked down to see a folded paper. I grabbed it, unfolded it, and read the note to myself. “Meet me at my house after school. We’ll talk to my parents there.” Tucking the paper into my pocket, I felt like I could relax, at least a little bit. I sat through school as best I could, jittery and nervous. When that last bell sounded, I was the first one out the door. I waited outside until Anthony walked up. “You coming?” he asked, taking my books from me. “Thanks,” I said as we walked along the street. “Look, what my parents are going to tell you isn’t going to sound normal. You’re probably not even going to believe them,” Anthony warned. “At this point, Anthony, I’ll believe anything,” I assured him. I must have zoned out, because the next thing I remember was passing shop windows and being half-way to Anthony’s house. Anthony shrugged, not saying anything. Anthony looked down. “It’s noth-” he stopped, staring at the black lines that seemed to have appeared out of nowhere. “Yes?” I asked, wondering why he sounded so nervous. “Run,” he whispered, grabbing my hand. Thanks for reading! Part 4 next week. My mom sits the supplies down on the floor and runs her fingers through her hair. “Where to begin?” she sighs. I look around me at the peeling, ancient wallpaper, the beat up floor, and the cobweb filled curtains and wrinkle my nose at the musty smell. I can easily think of a dozen other things I would rather be doing on this Saturday afternoon than clean out my grandfather’s old house. “Sure.” The stairs squeak under my weight as I climb the grand staircase to the second floor. The house is being sold soon, and it’s our job to clean and fix it up before it’s put on the market. At the top of the stairs, I stop suddenly. The hairs on the back of my neck stand straight up, my stomach clenches, my heart pounds. I happily visited my grandfather’s house many times in the past, but standing here now, I’m so scared it’s hard to even breathe. I can’t control the urge to look at what’s behind me. I slowly turn my head, glancing back, heart pounding. The only thing I see are the stairs spiraling down. I can’t shake the feeling that there is something behind me, though. It’s nothing. Just this creepy old house, I tell myself. I’m probably just jumpy because of that scary sci-fi movie I watched last night. Mom always says I have too much imagination. I can hear Mom’s voice in the kitchen, singing along to one of her favorite songs. My body relaxes, and I feel embarrassed at my reaction. I’m glad nobody saw me, I think. I walk forward, the floors creaking under my feet. The carpet under my brown boots is a faded red color and a style from a bygone age. Hand on the doorknob, I’m about to turn it, when I see a black shape out of the corner of my eye. I turn my head quickly, but there’s nothing there again. “It’s just an old house. Nothing more. Nothing is living in here,” I tell myself under my breath, but my hands shake as I push the door open. I half expect something to jump out at me, but nothing does to my relief. It’s just a bedroom. I look around, examining the sagging floral wallpaper and the grimy carpet. The meager light from the rainy day makes the four poster bed’s shadows look like monsters climbing the walls. I run my hand over the dust-covered carved wood of the footboard, brushing some of the dirt off onto the floor. Someone must have already cleared this room, because there are no boxes in here. There’s only the bed and a small three drawer chest next to it. Better check to make sure there’s nothing in there, I think. I kneel down on the floor, and my hands grip the delicate gold handles of the carved cherry wood nightstand, sliding open the first drawer. I reach my hand inside the dark hole, my fingertips brushing the smooth wood. There’s nothing in there. My hands move to the next drawer, and slowly slide it open. I reach my hand in again, and feel something slightly rough. I grip it and pull it out of the darkness to the light. It’s a little book. I run my hands over it, feeling the soft leather of the cover, examining the embossed flowers and birds. I carefully pull back the leather cover, revealing a faded, yellowed page. Like a delicate spider web, the swirly handwriting spirals across the page. My name is Karen Helms. And I am being followed. 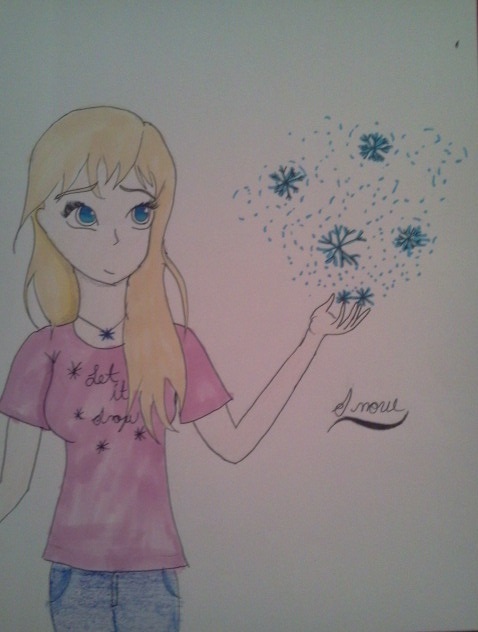 This is Snow, my character from my novel of the same name. She started her life in a small town in the arctic. Her life completely changes when Finley (who is down below) kidnaps her. It turns out she is a very special girl because she’s a Katari, a rare member of a race that can control nature. Snow has the ability to create and control ice and snow. Physically Snow’s most outstanding feature is her eyes. All Kataris have unusual blue eyes. She’s rebellious, independent, and stubborn because she’s been different all of her life, but Snow also has a sweet, kind side to her. 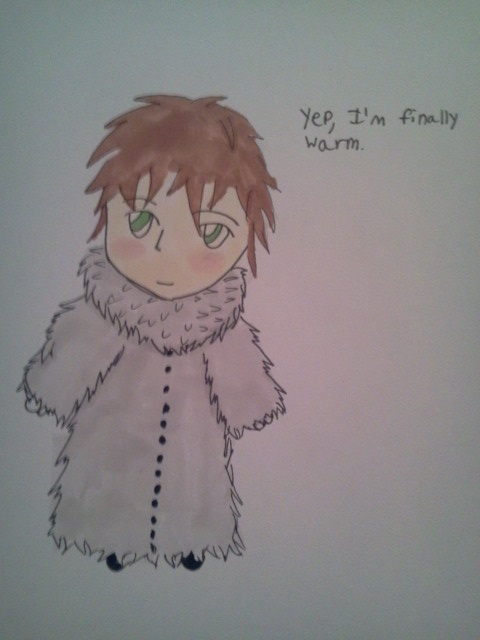 I’m planning on posting chapter one of Snow’s story shortly, so stay tuned for that! Myranda is my quirky Star Trek OC. She’s the niece of Major Kira on DS9, and after her parents are killed in the line of duty, Myranda comes to live with Kira. Myranda’s actually brilliant, being fluent in numerous languages and working at the station as a teenager. She hides her intelligence behind a mask of sarcasm, humor, and an outgoing and chaotic nature. The first thing you’d notice about Myranda is her flaming red curly hair. Her eyes are dark brown which she got from her Mom’s side. She’s a super fun character to write, and her voice is very unique. 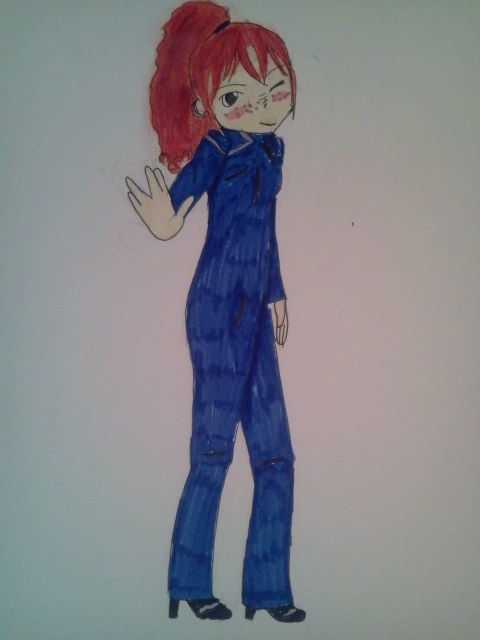 I also plan on posting my Star Trek fanfiction featuring Myranda soon. Have you ever found or drawn pictures of your characters? Let me know in the comments below! Last week, my two Owl City fanfiction characters, Arden and Ben, had just captured Queen Titania, the firefly that will help Ben cure his insomnia and fall asleep. Join me for the last part of their adventure! “Here you go!” She cut off my protest as she unclipped the red thermos from her backpack. I didn’t reach out for it right away, suspicious of alien intentions. “Arden, that’s the thermos you’ve been carrying around all night,” I pointed out. “Titania didn’t give you that.” Unless Titania was actually one of her alien agents, and the firefly was just a cover story. “It was empty before. As soon as we caught Titania, it filled with her sleeping potion.” Arden explained, twisting off the lid and handing me the bottle. I smelled it warily. I didn’t know what alien potions were supposed to smell like, but this certainly reminded me of something with earthly origins. I slowly lifted the thermos up to my mouth. “Go on!” Arden said with a smile on her face. “The potion tastes like whatever the person drinking it likes. It just tastes like warm milk to you.” Arden sat down on the grass and patted the space next to her. I sat down still wondering if it was truly warm milk I was drinking. I peered into the jar and stared at the fireflies we collected. The funny thing was, I actually felt a little sad letting them go. I twisted open the lid, and they flew out blinking. We watched them fly off and join the rest of their firefly friends. “I got misty eyes as they said farewell, didn’t you, Ben?” Arden asked. A couple tears fell from her eyes, and she brushed them away. “Arden, we’ve been over your legend,” I began, but stopped. Even if the legend wasn’t real, it was still a nice thought. “Did you know that fireflies flash in a pattern, Ben? You can tell the species of firefly just by the way they flash.” Arden began instructing me in the science of fireflies. I just watched the fireflies lighting up the lake. My eyelids soon felt heavy, and I could feel my head nodding forward. I just needed to lean back in the cool grass while Arden lectured on. The potion must be working. “Isn’t that great, Ben?” asked Arden. “Ben?” I didn’t bother to answer her. I was too tired. My eyes shut completely, and I fell asleep. “Ben, you’ll be turned to stone if you sleep here! Come on!” Arden grabbed my hand and tried to yank me to my feet. She tugged and pulled at my arm, until I finally struggled up to my feet so she’d stop. My vision was all blurry, and I could barely see anything. “Hurry, hurry! Queen Titania will curse us if we stay by her palace after dawn.” Arden yanked on my arm again, trying to pull me down the path. I stumbled forward, tripping over one of the tree roots. I fell on my face for the second time that night. “Are you okay, Ben?” Arden asked. I looked up to see Arden frozen in place with a terrified look on her face. “I know you’re not stone, Arden,” I told her, about to put my head back down in the leaves. She didn’t say anything. She just stood perfectly still with that look on her face. I knew she hadn’t been turned to stone. She couldn’t really be a statue. “Ohhhhhh. C’mon, Arden.”She was so frustrating sometimes. I couldn’t stand it. I had to check. Pulling myself up, I walked slowly over to her. “Arden?” Still, she didn’t move. She certainly didn’t look like stone. I thought I saw her breathing, but I wasn’t sure. I bet her skin would feel cold if she were really a statue. I reached out to touch her arm to test my theory. “AHHHH!” I screamed as the Arden statue came to life, making a face at me. I just glared at her. Arden kept laughing. “I’m sorry, Ben. Your reaction was so funny, and I’m pretty sleep deprived. I always get silly when I haven’t had enough sleep. You were just going to sleep there unless I did something to make you get up. It worked. You’re up! Now, onward, brave knights, onto our gallant steeds, and we shall ride off into the dawn!” Arden pretended to mount a horse, and then “galloped” off. I just stood there, shaking my head, wondering how sleep-deprived Arden was any different than normal Arden and wondering how she still had any energy left. I know I didn’t. We “galloped” up to the stairs of my front porch thirty minutes later. Arden chattered on about quests, fair ladies, and brave knights, but all I could think about was crawling into bed. “Let’s go pretend it’s winter and welcome it back, put on warm fuzzy sweaters, and watch the snowflakes fall gently to the ground!” Arden announced, skipping up my front porch steps. I looked up at the sky. The sun had risen over the horizon, and it was already hot out. It was going to be a scorching August day, and there was no way I was going to wear a sweater in this heat. Besides, I had no energy left whatsoever. If the stair railing hadn’t been there, I probably would have fallen over. “Arden, I think I need to go to bed. I’m exhausted,” I told her. Was I tired enough to go to sleep? I had only been chasing fireflies all night, tracking down dragons, and galloping through the forest. Yep, I was tired. I yawned and nodded, my eyes already half-shutting. I groaned and nodded. I was so tired I could barely keep my eyes open. Arden yanked open the door, and skipped inside, pulling me along with her. “Good-morning, Mrs. Sweet!” she called cheerfully. “I’m fine, Mom. Just tired,” I mumbled. “I was helping him fall asleep by catching fireflies and finding Queen Titania, the lightning bug that will help him not feel like such an insomniac,” Arden told my mom, who nodded politely. I was sure she was thinking that Arden was crazy. “Good-night, Ben! Or should I say good-morning?” She giggled at the thought, following me down the hall to my room. “Whatever you’d prefer,” I grumbled falling into bed. Arden switched off my light. “Leave my door open just a crack,” I muttered, shutting my eyes. In a moment, I was fast asleep. *Fireflies by Owl City plays* Welcome to this week’s installment of Fireflies, my Owl City fanfiction! Last time, Arden and Ben were setting off on their adventure to help Ben beat his insomnia by catching a special firefly. Will poor Ben ever get to sleep? Stay tuned! “The lake is about a mile and a half walk,” I protested trudging along behind her. “And the last time I looked there were no mountains, forest, or dragons in our town.” Not to mention fairies or fireflies named Titania. “They’re the cold mountains, and they aren’t too far away. We need a song to sing while we walk. Maybe an ol’ sea shanty, mate! Argh.” She did her best pirate impression. “Or maybe a song about fireflies! I’d get a thousand hugs from ten thousand lightning bugs …” she started to sing. “I feel like I’ve heard that somewhere,” I told her. “How about we don’t sing?” I suggested. “You’re no fun, Ben! But, oh, if we don’t sing we can pretend we’re creeping through the forest, looking for the dragons so we can arrest them. Officer Hart calling Officer Sweet.” She said the words into her hand and made a clicking sound with her tongue like a radio clicking on and off. I stared at her, wondering how one girl could have so many strange ideas mixed up in her head. “But, Arden. Police officers and dragons don’t have anything to do with each other.” This crossing of storylines was too much for me. “Pst! You have to talk back in your radio, Ben!” Arden whispered, holding up her hand. “Officer Sweet calling Officer Hart,” I said, giving in to her demands. I sighed, looking up into the night sky, and held my hand up to my mouth. “Police don’t track down dragons. Dragons aren’t real. So you couldn’t possibly have seen a dragon. Right, Arden?” There was no answer. Looking around me, I realized Arden was nowhere to be seen. “Arden?” I called again. Still, there was no answer. It was just me and the fireflies. Maybe she’d gotten distracted and was chasing down another imaginary creature. “Arden!” I called, hoping she would appear. After a few more minutes of silence, I started getting worried. There was only one thing to do. I pulled out my cell phone and dialed Arden’s number. “I’m where I was when you left me. Where are you, Arden? I thought I lost you,” I told her. “I’m fighting a dragon and oh, look!” Arden squealed on the other end of the phone. Then the phone went dead. “Arden?” I cried. “Arden?” Immediately, my mind flooded with a million horrible things that could have happened to her. Maybe a kidnapper got her, or she fell into a hole, or a bear attacked her. Maybe she could have even run into a dragon. If there really was a dragon, I decided I couldn’t leave her to fight it alone. With that thought, I dashed forward, calling her name.